Hoyle, Tanner & Associates, Inc. (HTA) has been assigned, through a retainer contract with the Vermont Agency of Transportation (VTrans), the task of preparing an Engineering Study for the rehabilitation of the Hutchins Covered Bridge. The project's Priority of Uses as defined by the Historic Covered Bridge Preservation plan is "Special Use on Roads" if a six (6) ton live load is pursued and "Limited Use on Roads" if a twenty (20) ton live load is pursued. 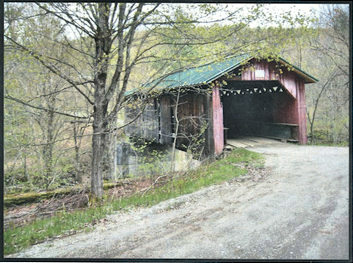 The Hutchins Covered Bridge was inspected and load rated to determine it's current condition. Our rating assumes replacement of deteriorated bridge members. It was determined that at the inventory stress limit the existing trusses have a live load capacity of approximately H7.8 (7.8 tons), the floor beams have a capacity of H4.2 (4.2 tons), and the deck has a capacity of H7.2 (7.2 tons). 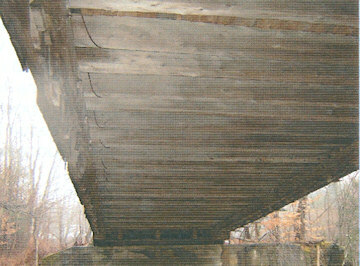 Additional items are discussed in this report and recommended for the bridge include a temporary detour bridge, utilization of a Class 4 Town Highway as a detour, new siding; substructure repairs, replacement of deteriorated bridge members; fire protection, bridge approach railing, new backwalls; and realignment of the trusses. The total estimated cost of all recommended work items utilizing a temporary detour bridge and six (6) ton live load limit is approximately $578,025.00 including contingencies. The total estimated cost of all recommended work items utilizing a temporary detour bridge and twenty (20) ton live load limit is approximately $777,525.00 including contingencies. HTA has been assigned, through a retainer contract with VTrans, the task of preparing an Engineering Study for the rehabilitation of the Hutchins Covered Bridge. On November 30, 2005 an Inspection Team from HTA visited the bridge to perform field observations and gather field data for this Engineering Study. 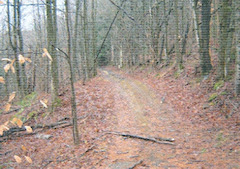 An archeologist from Hartgen Archeological Associates, Inc. (HAA) visited the site on April 5, 2006 to assess the potential of encountering National Register listed or eligible sites which may be effected by the project. The Hutchins Covered Bridge is located in the Town of Montgomery, Vermont and was built in about 1883 by Sheldon and Savannah Jewett of Montgomery. The bridge's seventy-six (76') foot single span timber superstructure utilizes Town Lattice trusses spaced at 17'-10" on-center (see Appendix C for existing and portal sections and plan view). The bridge runs east to west and crosses over the South Branch of the Trout River on Town Highway No. 27. It is supported by abutments originally constructed out of large stones. The east abutment has been encased with concrete. 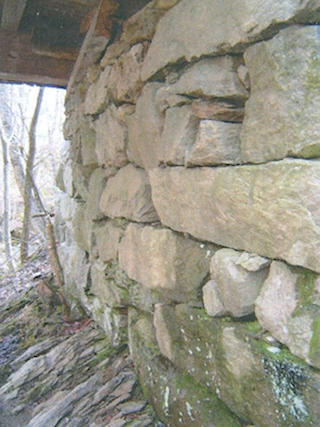 The west abutment is constructed from dry laid stones and abuts the former Hutchins Mill foundation which serves as the northwest wingwall. The bridge is open to traffic and is on the National Register of Historic Places. On November 30, 2005 an inspection team from HT A visited the bridge to perform in­depth field measurements and gather field data for this Engineering Study. Mr. Scott Perry representing the Town of Montgomery and Mr. John Weaver representing VTrans were also on site in the morning to discuss the project. Four (4) small wood samples were removed from the bridge for the purpose of species identification. The samples were taken from deteriorated members that will most likely be replaced during the course of the bridge rehabilitation. The samples were forwarded Doug Gardner, Ph.D., a professor of Wood Science and Technology, at the University of Maine at Orono for identification. From analysis, it was determined that the deck and the truss chord samples were Eastern Hemlock and the lattice sample is Spruce. The trunnel sample was determined to be hard maple which is somewhat unusual; oak is more typically utilized for trunnels. This species evaluation is consistent with historical records that indicate native wood was used during construction. A copy of Dr. Gardner's report is included as Appendix A. The bridge crosses over the South Branch of the Trout River which runs roughly north to south at the bridge site. At the time of our inspection there was approximately 20-feet of vertical clearance above the water level to the lower chord bottom face elevation. The VTrans Hydraulics Unit completed a preliminary hydraulic study dated May 25, 2005. The conclusion of the study was that both there is approximately 11' of freeboard over Q100 so hydraulic capacity is not an issue at the site. Scour Analysis was not performed since the abutments are founded on ledge. A structural analysis was performed of all key members of the bridge superstructure. The Service Load (Allowable Stress) design method was used for all members as required by the VTRANS Structures Manual (Chapter 22, Section 22.1). Allowable stress values for wood members were obtained from the 2005 National Design Specification for Wood Construction and Supplement. The wood species used in the superstructure was identified through testing (see Section 5). The grade assigned to each member was based on a visual examination of knots, checks and the growth rate characteristics of the wood. All superstructure members are wood unless noted otherwise. The condition of each member is detailed in the following sections. In addition, initial recommendations for repair of replacement are made which must be reviewed by the Historic Covered Bridge Committee (HCBC) to assess the structural and historical issues. We have also identified in the recommendations for Sections 7.1 through 7.5 the priority treatment numbers from the Historic Bridge Preservation Plan to aid in review. It should be noted that not all members to be replaced can be identified based on our inspection due to inaccessible areas (outside face of bottom chord, etc.). The contract documents and estimate of cost in this study include an additional amount of conditional replacement where appropriate to determine an appropriate budget for the project. The roof framing consists of a new standing seam metal roof installed in 2002 and attached to 7/8" thick roof boards. The roof boards are supported by 3" x 5" rafters spaced at 2'-0" on­center. The rafters are largely supported on the top chord of the trusses, while some rafters frame into the crossbeams. The roof framing also includes a 6½" x 9" ridge beam and 6" x 6" support post supported on the cross beam. 4" x 4" braces span between the cross beam and support post. The rafter and roof board wood species is Eastern Hemlock for analysis and they have been assigned a grading of Select Structural. The roof framing is in good condition. A section of roof rafters and roof boards were replaced in 2002 when the new standing seam metal roof was installed. The members were replaced due to a large leak in the roof which also severely damaged the trusses. See Section 7.3. The roof rafters were analyzed for dead load and a ground snow load of 50 PSF (33.3 PSF roof applied) per the 2005 Vermont Fire and Building Safety Code snow load and the 2006 International Building Code. 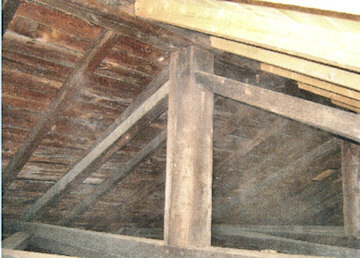 The rafters and roof boards were found to be adequate for the applied dead and snow loading. The metal roof is in good condition having been installed in 2002 and should be retained. 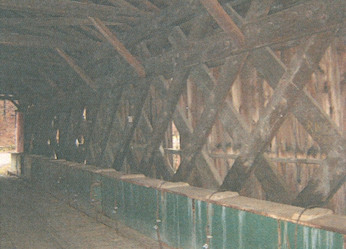 Replacement of selected roof boards and rafters was also completed in 2002. We did not note any recent damage to the roof boards or rafters and therefore are not recommending any replacement of these members. We also are not recommending any replacement at the ridge beam support post and braces. 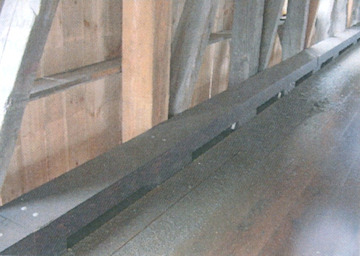 The top lateral bracing consists of 4" x 4" knee braces, 7½" x 7½" crossbeams at 8'-0" on center bearing on top of the rafter support beam and 4" x 4" cross bracing between the cross beams. The 4"x4" knee braces bear on chord 2 with a nailed connection. The lateral bracing in the bridge is in fair to good condition. The bridge trusses are racked between 3" and 5" depending upon the location. The racking of the bridge has broken the ends of two (2) crossbeams at the northeast corner of the bridge and loosened or cracked several knee braces. The existing top lateral bracing is adequate to resist code required wind and snow loads. Install a lag bolt at top lateral bracing intersection. Install a lag bolt at the base of all knee braces. We have assumed that local (northeast) wood species will be used for the members above. It is important to note that they may not be readily available for the cross beams due to the size, length and grade needed. The bridge utilizes Town Lattice trusses with members in very poor to good condition. The chords were identified as a Eastern Hemlock species with a grade of select structural assigned for analysis. The lattice members were identified as a spruce species with a grade of select structural assigned for analysis. Steel beams have been added inside of each truss to help support the bridge due to the poor condition of the truss upper chords. 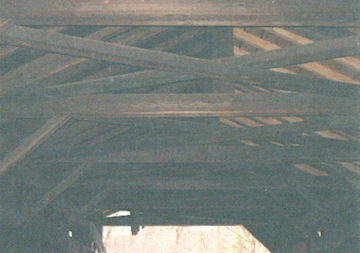 The trusses are generally in good condition with several locations in the south truss in very poor condition. In these locations, long term leaking of the roof has caused extensive rot with all four (4) chord members broken in one (1) location in the top chord of the south truss. The trusses also exhibit 3" to 5" rack to the south. The camber (or sag) of the bridge was not measured due to the installation of steel beams in the bridge which are supporting it. 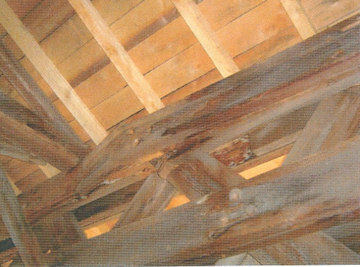 The trusses bear on wood sleeper beams, the size and length of which vary at each bearing. There are no concrete backwalls at the ends of the chords and extensive rot was noted in these locations. We have assumed for this study that all four (4) pieces of chord 4 at the ends of the trusses will be replaced. We will investigate this assumption further during the design of the project with a goal to retain as much material as possible. The trusses were analyzed to determine their current live load capacity. A 3-D, full bridge computer model was utilized for our analysis. Full dead and live loads were applied and compared to inventory stress levels and full dead, live and snow loads were applied and compared to the higher operating stress level. The live load capacity of the trusses was found to be H7.8 (7.8 tons) at inventory and H8.0 (8.0 tons) at operating both ratings are controlled by lattice to chord trunnel capacity. This rating assumes that a total of eight (8) connections at the end of the bridge are strengthened. Due to the location of the bridge on a dead end road, we have evaluated two (2) live load capacities of the bridge; six (6) tons and twenty (20) tons. A six (6) ton live load capacity would require no member replacement for strength considerations. A twenty (20) live load would require installation of steel or wood stringers beneath the floorbeams and installation of new floorbeams and decking. 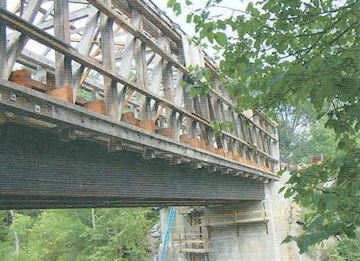 This approach was used in the Union Village Covered Bridge in Thetford, VT where four (4) glulam stringers were installed beneath the bridge on new abutments and new glulam floorbeams and decking were also added. Due to the stresses in the trusses and difficulty in obtaining local species, select structural Douglas Fir or Southern Pine is proposed for replacement members in the trusses. Upgrade truss connections as required. The existing floor framing consists of a 3" thick plank deck with 2" thick runners supported by floorbeams spaced at approximately 2'-0" on center that are either 7¼" x 9" or 7¼' x 10¼' in size. The decking was identified through testing as an Eastern Hemlock species and the floorbeams were assumed to be the same species. A grade of select structural No. 1 was assigned for analysis. The deck and floorbeams are in fair to good condition with some rot in the deck and large knots and splits in the floorbeams. The existing floor beams and decking were analyzed to determine their live load capacity. The deck capacity was determined to be H7.2 (7.2 tons) assuming a No.1 grade. The floorbeam capacity was determined to be H4.2 (4.2 tons) for a NO.1 grade at inventory and H5.9 (5.9 tons) at operating. If the grade of the floorbeams is assumed to be select structural, the capacity is only increased to H5.3 (5.3 tons) at inventory and H7.3 (7.3 tons) at operating. Based upon a visual evaluation of the floorbeams, we believe the No. 1 grade of the floorbeams should be used due to the large number of edge knots, wane and splits in the existing members. Based upon the condition of the deck and floorbeams and an H6.0 (6.0 ton) live load goal, we recommend complete replacement of the floorbeams and decking with new sawn members of approximately the same size. The species of the new members would be Douglas Fir or Southern Pine to meet the H6.0 (6.0 ton) live load requirement. If H20.0 (20.0 ton) live load capacity is required, glulam decking and floorbeams would be required as discussed above. In addition, we recommend that a new wood curb be added to the bridge to help keep vehicles from impacting the trusses and knee braces. 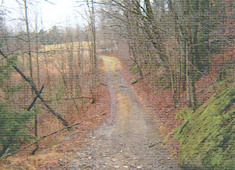 This curb has previously been used by VTrans on the Union Covered Bridge in Thetford, the Comstock Covered Bridge in Montgomery and the Greenbanks Hollow Covered Bridge in Danville. The east abutment and wingwalls were most likely originally constructed out of large stones at some unknown date and were encased in concrete. The abutment and wingwalls are in good condition with some cracking and minor spalling noted. There does not appear to be a concrete or stone backwall and no weepholes were noted. The west abutment and wingwalls are constructed of dry laid stone. 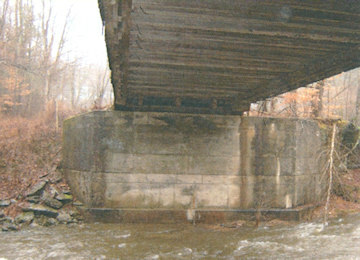 The abutment is founded on ledge while the wingwall foundation is unknown. The abutment and wingwall are in fair to good condition with some bulging of the abutment breastwall and missing stones noted. 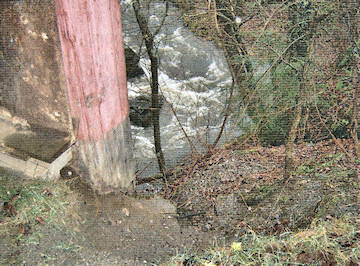 Poor drainage and a short wingwall have lead to heavy erosion at the southwest corner of the bridge. The west abutment was analyzed for overturning and sliding per the VTrans structures manual with an assumed breastwall depth of 5'-0" deep due to the noted bulging of the breastwall. Two (2) conditions were checked for the abutment. The first condition analyzed the abutment alone with soil loading and no dead load. This condition may occur while the bridge has been removed during construction and the dead load of the bridge is not applied to the abutment. The second condition includes both soil loading and a live load surcharge acting on the abutment without dead load. We determined that for both conditions, the factor of safety for overturning and sliding met VTrans requirements. The east abutment appears stable and therefore was not analyzed. The following repair/replacement recommendations are made for the bridge substructure units. For additional work due to twenty (20) ton vehicle loading, see 7.3,recomendations. Install three (3) 4" diameter weepholes to relive potential hydrostatic pressure. Apply a water repellent to all surfaces. Construct a new concrete backwall. Construct a new concrete bearing pad and backwall. Construct a new stone wingwall extension at the southwest corner of the bridge. 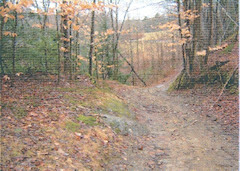 Both bridge approaches are gravel and are in fair to good condition with steep grades beyond each end of the bridge. There is no guardrail installed at either end of the bridge. There are no bridge closed, vertical clearance signs, or weight limit signs posted within the immediate vicinity of the bridge with exception of one weight limit sign found on the ground near the east portal. We recommend that each approach to the bridge be regraded and weathering steel guardrail be added to each corner of the bridge. There is no known fire protection system at the bridge. Three (3) fire detection/protection systems are generally used for covered bridges; fire retardant coating (NOCHAR/Poloseal), fire detection system (Protectowire) and a dry deluge sprinkler system. A fire-retardant coating, such as "NOCHAR" or "POLASEAL", can be used to protect the bridge from fire. This coating works by raising the flashpoint of the wood and therefore making it difficult to start a fire. The coating is available in colored and clear versions that are applied to the wood by brush or spray. The coating does not affect the strength of the wood. If a fire is started, it is advantageous to notify the local fire department as soon as possible. The "Protectowire" system works by running a small wire through key locations in the bridge. If a rapid rise in temperature is detected or if a wire is cut, the system alerts the local mutual aid or fire department. This advanced warning can greatly reduce fire damage to a bridge and hopefully prevent the fire from making the bridge a total loss. A deluge sprinkler system is not recommended for this bridge since the span is relatively short and water can be directed to the center of the bridge from either end. For the purposes of this study, we have assumed that the NOCHAR and POLASEAL will be used on the bridge. We have not included a protectowire system for the bridge based upon our previous experience with the Town of Montgomery; however, we recommend the option of installing it be presented to the Town. The estimated cost of installing a protectowire system is $15,000 - $20,000 since there is no power source near the bridge. We recommend that the Town, specifically the fire chief, make the final decision on which systems should be used on this bridge. There is no lighting present on the bridge or at the immediate approaches. Lighting can be an effective means to deter vandalism and improve visibility at night. The decision to add lighting to the bridge should be made by the Town. For this study, the cost of adding interior lighting to the bridge has not been included in the cost estimate in Appendix B. 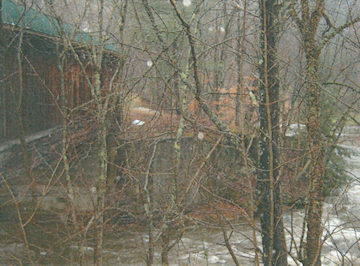 The Hutchins Covered Bridge serves a single residence at the end of a dead end road. We understand that the resident may only reside in the house on a seasonal basis. If so, consideration should be given to scheduling construction of the project when they are away assuming provisions for fire fighting are made. We have assumed for this study that access to this residence during construction will be required. Two (2) traffic control options were considered for this study; A) installation of a temporary bridge to the south of the bridge and B) upgrading TH 27 (Class 4 road). 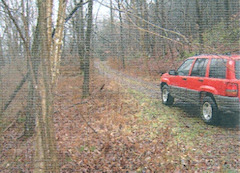 Temporary construction easements were obtained for Option 1 on December 27, 2001. Each option is discussed in more detail in the following paragraphs. Option A includes minor clearing, temporary fill and installation of a temporary bridge and guardrail directly south of the existing bridge. As discussed above, temporary easements have been obtained by VTrans outside the assumed 3-rod right-of-way. The proposed location of the temporary bridge is in Figure 1 in Appendix C.
VTrans prepared a cost estimate dated February 24, 2005 of $146,777.66 for the temporary bridge and associated site work. This estimate appears reasonable with the exception of the one-way temporary bridge cost of $125,000.00. Due to recent flooding in VT, NH and ME the cost of temporary bridges has increased with increased demand. We estimate this cost today to be $160,000.00. Adjusting this item and increasing the estimate for inflation, we estimate the total cost of Option A to be $185,000.00. TH 27 Through Field TH 27 Near Gibou Rd. TH 27at Gibou Rd. A great deal of work will be required to upgrade TH 27 to meet the State Standards above. 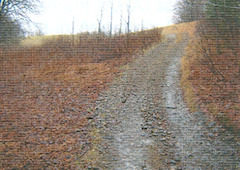 Since the road is terraced into the side of a hill in most locations, extensive retaining walls with guardrail will be required to widen the road. In addition, tree clearing and ledge removal will be required in some locations. Hartgen Archaeological Associates (HAA) reviewed TH 27 for potential impacts (see Section 12), which also must be considered. The estimated cost to upgrade TH 27 as a detour route is $315,000. Please note that this is a conceptual estimate and ground survey would be required for a more detailed estimate. VTrans conducted an Archeological Field Review at the areas immediately adjacent to the bridge (See Appendix E). The purpose of the review was to determine any potential impacts the project may have. The review identified the remains of a former tub factory at the northwest corner of the bridge and concluded there were no other areas of concern due to the steep slopes on the other three (3) corners of the bridge. The results were presented at the December 2, 1998 DHP meeting and it was agreed that a temporary one-way bridge south of the existing bridge would not effect any significant archeological properties. HT A retained HAA to perform an Archeological Resource Assessment (ARA) along the TH 27 Detour Route. A complete copy of their report is included in Appendix E. HAA subdivided the detour route into four (4) areas with Area 1 being closest to the bridge and Area 4 being the southernmost area. Area 1 - A fieldstone foundation and cellar hole were located. HAA recommends that area be cordoned off and the area between it and the detour be studied further. Area 2 - Archeological shovel testing is recommended. Area 3 - Archeological shovel testing is recommended. Area 4 - Archeological shovel testing is recommended at a small terrace area. Repair the west abutment (crack sealing, waterproofing and add weep holes). Reconstruct the west abutment breastwall. Install a new stone wingwall extension at the southeast corner of the bridge. Install concrete backwalls at each abutment. Install a temporary detour bridge to the south of the existing bridge. Install weathering steel guardrail at the four (4) corners of the bridge. Regrade 50' of approach pavement at each end of the bridge. The total estimated cost of all recommended work items is approximately $578,025.00 including 5% for contingences. A complete breakdown of this estimate is included in Appendix B. All items included under the six (6) ton live load option. Install new concrete abutments in front of the existing abutments to support longitudinal stringers. Install longitudinal glulam stringers beneath the bridge. Additional upgrades to the bridge trusses. Upgrade floorbeams and decking to glulam. The total estimated cost of all recommended work items is approximately $777,525.00 including 5% for contingences. 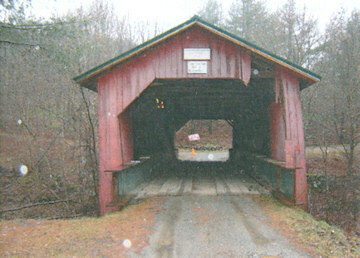 A complete breakdown of this estimate is included in Appendix B.
Hoyle, Tanner & Associates, Inc. (HTA) has been assigned, through a retainer contract with the Vermont Agency of Transportation (VTrans), the task of preparing an Engineering Study for the rehabilitation of the Hutchins Covered Bridge. Rehabilitation of the bridge for a six (6) ton and twenty (20) ton live load capacity were studied. The project's Priority of Uses as defined by the Historic Covered Bridge Preservation plan is "Special Use on Roads" if a six (6) ton live load is pursued and "Limited Use on Roads" if a twenty (20) ton live load is pursued. An option was investigated to increase the live load capacity of the bridge to twenty (20) tons. Since the trusses are unable to support twenty (20) tons, glulam stringers, floorbeams and decking would be required. Two (2) detour options were evaluated for the project A) installation of a temporary bridge to the south of the bridge and B) upgrading TH 27 (Class 4 road). The estimated cost of Option A is $185,000.00, while option B is $315,000.00. The much higher cost of Option B is due to its length (1,800') and location (terraced into a hill). 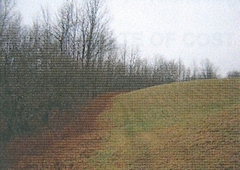 The geometry of the hill location necessitates a large amount of fill and retaining walls to meet state standards. Option A is recommended due to its lower cost and much smaller environmental impact. The total estimated cost of all recommended work items utilizing a temporary detour bridge and six (6) ton live load limit is approximately $578,025.00 including contingencies. The total estimated cost of all recommended work items utilizing a temporary detour bridge and twenty (20) ton live load limit is approximately $777,525.00 including contingencies.